A recent post on Mailing Lists For Institutional Web Managers summarised the value provided by mailing lists such as web-support and website-info-mgt in providing an environment for asking questions and sharing best practices which, in the mid-1990s helped in the development of a thriving community of practice. However in recently years usage of these mailing lists has declined significantly. Although this may reflect a maturing of the community and the importance of the annual IWMW event, which provided the value of face-to-face meeting, the decline in the number of posting to mailing lists also coincided with the growth in Web 2.0 services which provide new and richer ways of supporting collaborative activities and communication. This post therefore summarises one particular social media service which may be of value to those working in institutional web management teams: blogs. Perhaps the obvious social web technology which may have supplanted mailing lists as a communications and sharing service for members of institutional web teams woild be web team blogs (or professional blogs provided by individual members of web teams). We’ve been blogging in the web team for over a year now and it’s become another part of the work I do but some conversations I had at IWMW 2008 got me thinking about the wider Higher Education Community. I also don’t think there aren’t enough of us doing it for people to see the real value – yet! If more of us used blogs then we’d be able to gain a real picture of the work going on across all Universities (which would make the idea I pitched at IWMW really useful – and easy!). The reason why we (a community college) don’t blog is because the management does not like to have control taken away from their communication. We don’t use social networking sites at the moment as conversations can’t be controlled, we don’t blog because we can’t control the comments and when we add a video to Youtube we get asked if we can influence the related videos. I’m trying to get across that you have zero control when you are not participating about the conversations people have about your institution and that taking part in the conversation is an opportunity to get your message across but it doesn’t come naturally to management and people not used to digital communication. But surely such institutional conservatism would (slowly) be overcome, as the benefits became appreciated and the risks of not engaging in use of social media became better understood: yes, there are risks in using social media, but there are also risk in not doing so! two years on from the initial discussions, the lack of blogs describing the work of University Web teams is still very noticeable. At this year’s IWMW 2010 event there are over 170 participants gathered at the University of Sheffield. If every individual agree to write one post per month there would be over 2,000 posts described their work by this time next year. If you include members of institutional Web teams who aren’t attending IWMW 2010 it would not be unreasonable to expect 3-4 posts per month from team members, which may include HTML and CSS experts, designers, user interface experts, information architects, software developers, user support staff and managers and policy makers. If all Web teams across the 166 UK HEI institutions were to write four posts per month we would then have over 7,500 blog posts! 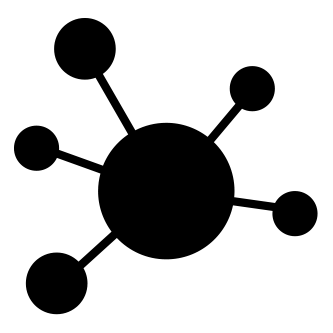 Today, in February 2016 we can look back at the post opportunities: if the 170 participants had written just one blog post every year between 2010 and 2016 we would have 1,190 blog posts about institutional web activities! But how would we access such content? As browsing across 170 blogs would be time-consuming the answer would be to aggregate the content. And in the blog post an aggregation service was announced: the Google Custom Search Engine was used to provide a search facility across institutional web team blogs which were known about. 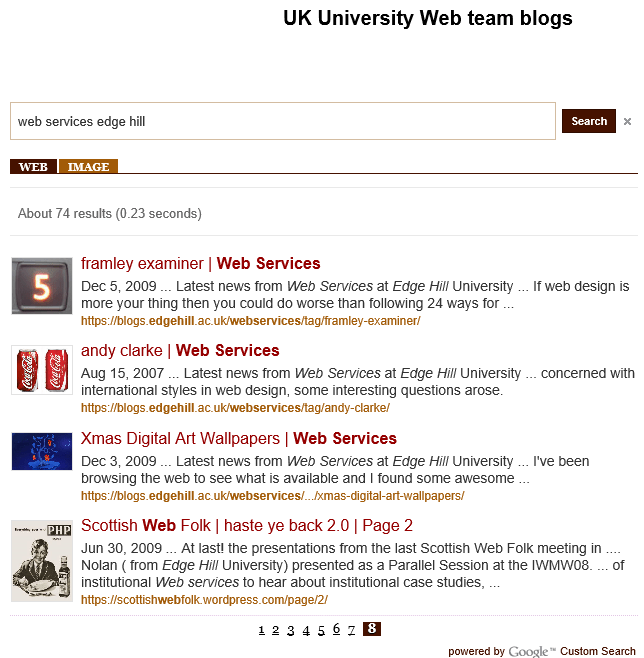 If you use the institutional web team search facility to search for “web” you will get a few dozen results; a more focussed search for “web services edge hill” currently provides 74 results, as shown (note in order to get an accurate figure for the number of hits you should click on the link to the final page of results, as the initial figure is misleading). Several of the blogs which are included in the Google Custom Search are either no longer in existence or are no longer being maintained. However one blog in particular provides a good illustration of an effective approaches to providing an institutional web team blog: the University of Bath’s Digital Marketing & Communications blog. I should confess to a slight vested interest: I worked at the University of Bath for over 16 years and know several members of the university’s Digital Marketing and Communications team. An example for others to emulate or an exception to the norm? Having re-discovered the search facility across institutional web team blogs I intend to remove non-existent blogs, archive blogs which appear to be no longer maintain and add relevant new blogs including personal blogs which provide significant numbers of posts concerning institutional web management. So if you are aware of relevant blogs please get in touch either by email, Twitter or by leaving a comment on this blog. But perhaps institutional web teams blogs will continue to be provided by a small number of institutions. A follow-up post will explore social media services which can support sharing discussions across the web management sector.